Areas prospective for coalbed gas in the Blackhawk Formation and Ferron Sandstone Member of the Mancos Shale, and the gas fields developed in those areas. Over the past 10 years, gas recovered from deep coalbeds has become a significant part of Utah’s natural gas supply and reserves. The U.S. Energy Information Administration reports that in 2000, coalbed gas made up about 35 percent of Utah’s 4.5 trillion cubic feet (Tcf) of proven natural gas reserves. Thus, coalbed gas, once regarded as mainly a safety hazard for underground coal mines, has been transformed from a poorly understood resource to a major new source of natural gas in Utah, and elsewhere in the U.S. The improved understanding of coalbed gas was fostered by government-funded research and tax credits during the 1970s and 1980s that helped petroleum companies develop new techniques to recover this once-unconventional gas resource. Exploration for coalbed gas in Utah began in the early 1980s; however, the first significant production began in 1992. The earliest exploration tested the gas resources of coals in parts of two formations near Price, Utah: the Blackhawk Formation and the Ferron Sandstone Member of Mancos Shale. 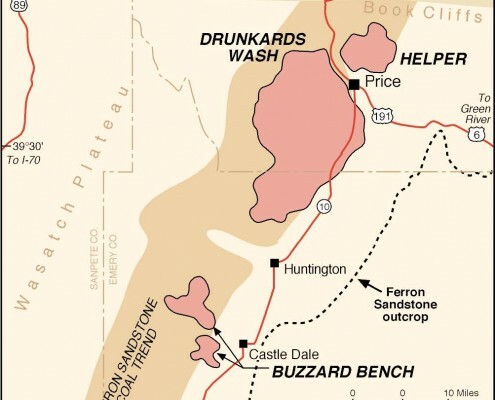 The coals of the Ferron Sandstone have become the major coalbed gasproducing area of Utah. As of the end of 2001, Anadarko Petroleum Corporation, Marathon Petroleum Corporation, Phillips Petroleum Company, and Texaco Exploration and Production Company had over 490 wells producing coalbed gas from the Ferron strata. The Utah Division of Oil, Gas and Mining reports that these wells provided over 28 percent of Utah’s 2001 gas production, an increase from the 25.6 percent produced in 2000. Company development plans discussed in two recently released Environmental Impact Statements indicate that the Ferron trend could have 800 to 900 gas wells in production within the next five years, which will probably double the amount of gas currently produced. Originally the coalbed gas wells were projected to have a productive life of 20 years and average recoverable gas reserves of 1 to 4 Bcf. Improved understanding of the nature of these gas reservoirs, gained from testing during the early life of the first wells, indicates that the original productivity estimates are likely conservative. 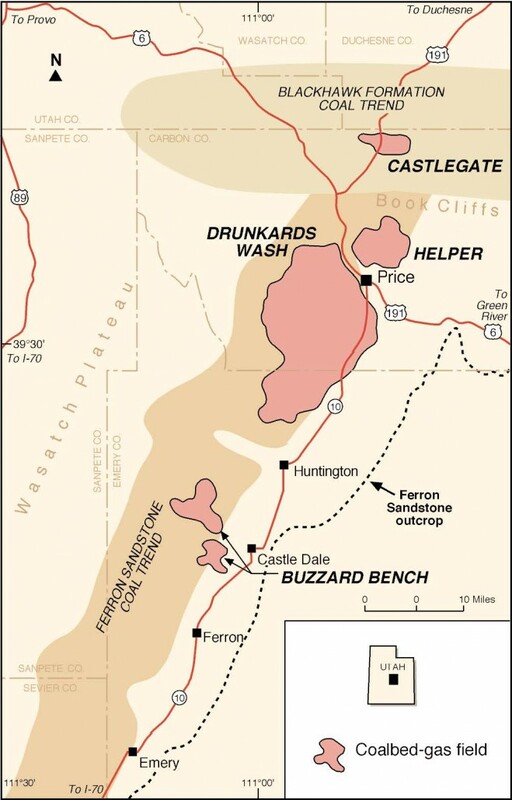 Within the Ferron trend, the Drunkards Wash field is currently the third-largest gas producer in Utah, and this field will likely be the most productive gas field in the state when it becomes fully developed by about 2005. While the Ferron trend has been the key area helping to maintain Utah’s gas productivity levels in recent years, other coal fields in the state are also attracting company exploration efforts. The Blackhawk Formation coals of the Book Cliffs coalfield have an exploration history as long as the Ferron coals, but more problematic water-disposal and well-completion issues have stalled production from the Book Cliffs area. Starting in 2000, a joint venture by J.M. Huber Corporation and Patina Oil and Gas Corporation began revitalizing the dormant Castlegate project. The wells drilled for this project, which produced gas from 1994 through 1997, were plugged and abandoned by Anadarko Petroleum Company at the start of 1998. Huber and Patina have begun redrilling the 25 original wells, and list the proved reserves for the Castlegate project as 27.5 Bcf of gas. The production for this field was 0.14 Bcf in 2000 from six wells, and production for 2001 will probably be double that as more wells are brought into production. The 62,000-acre Blackhawk trend could contain about 500 Bcf of recoverable gas reserves, or enough gas to supply 500,000 Utah resident’s gas needs for about 10 years. Thus, Utah’s coalbed gas resources will likely help provide stable long-term gas supply for its residents. For more information on coalbed gas resources contact David Tabet of the Utah Geological Survey at davidtabet@ utah.gov, or 801-537-3373. Information on coalbed gas production can be found on the Utah Division of Oil, Gas and Mining website at dogm.nr.state.ut.us/oilgas/STATISTICS/ production/coalbed/ACB_GAS PROD.HTM.